Hello, friends! Ça fait longtemps, mes amis ! Sorry I haven’t written in awhile—I spent a crazy weekend in Florence and an awesome Thanksgiving week with my boyfriend here in Paris. I didn’t have much time to blog, but I did have time to have some sweet adventures, which you’ll get to read about in due time. For now, I still have much to catch you up on my week-long trip across central Europe. So get ready for Berlin Part Deux because…. The American candy sector, that is! After a fun-filled first day in Berlin of munching American-manufactured Jelly Bellies along the River Spree, eating Italian pizza in Kreuzberg (or was it Prenzlauer-Berg? Too many “bergs,” too little time), and drinking my favorite French tequila-flavored beer called Desperados, Ella and I were ready to say goodbye to the various cultural influences in Berlin and hello to experiencing the German culture on its own. 1) To us, this means walking all over creation and trying to hit as many important monuments, memorials, and museums as we possibly could in Berlin. On Day 2 we found ourselves at the Berlin Wall Memorial, Kunsthaus Tacheles, the Memorial to the Murdered Jews of Europe, Reichstag, the Brandenburg Gate, Checkpoint Charlie (see picture above), Berliner Dom, the DDR Museum, and so many other places I probably could tell you about if I knew what their names were in English. Nowadays, Ritter Sport Chocolate is a common occurrence on the candy shelves of every CVS and Rite-Aid across America. In truth, I had never really favored the chocolate at home (unlike my friend Jenna, who adores the chocolate like it’s her future first-born child. Hi, Jenna!). I tend to always skip over the Swiss Ghirardellis, Belgian Godivas, and German Ritters for something a little more close to home, like the American Hersheys and even the French Nestlés (I’m studying abroad in Paris, after all). After what seemed like at least twenty miles of teeth-chattering and trekking across Berlin—and it probably was around twenty miles, only because I may or may not have directed Ella and myself multiple times in the wrong direction—we found it. Much less conspicuous than the ostentatious Hershey’s and M&M’s stores in Times Square, NY, the two-story Ritter Sport Store was tucked underneath a simple multi-colored awning. If it wasn’t for the tiny square sign with the Ritter Sport logo peeking out from the side of the building (and for my fine-tuned sixth sense of locating candy stores), we probably would have walked right past it. Thank goodness we didn’t. Because it looked like this. 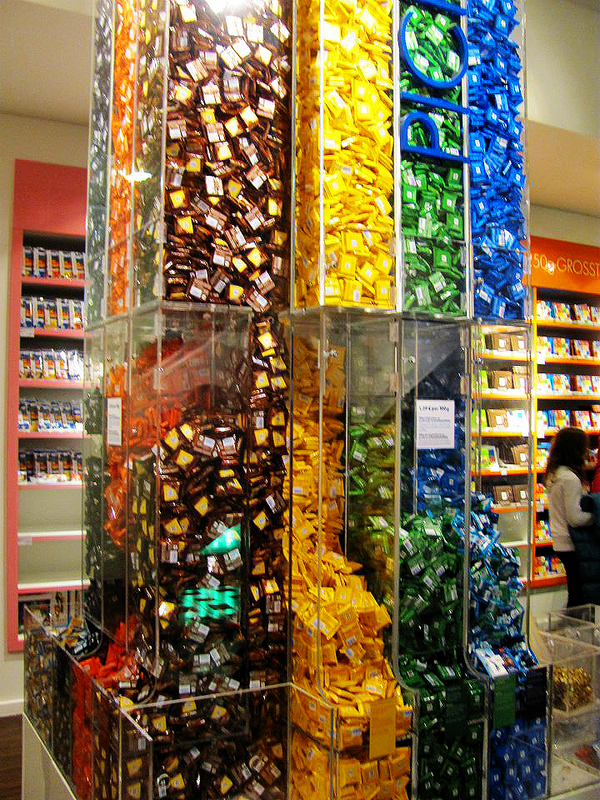 Yes, that is a 15 foot tall display of giant (unfortunately fake) Ritter Sport chocolate squares. Could you imagine if I had that huge column in my room? It would probably be gone in a week. That’s kind of an exaggeration. There were so many flavors to choose from—I honestly got worked up just trying to limit myself to three. After a few minutes of intense concentration, though, I chose three of their infamous square bars: Karamell Nuss (Caramel Nut), Napolitaner Waffel (Neapolitan Wafer), and Knusperkeks (Bitter Biscuit). 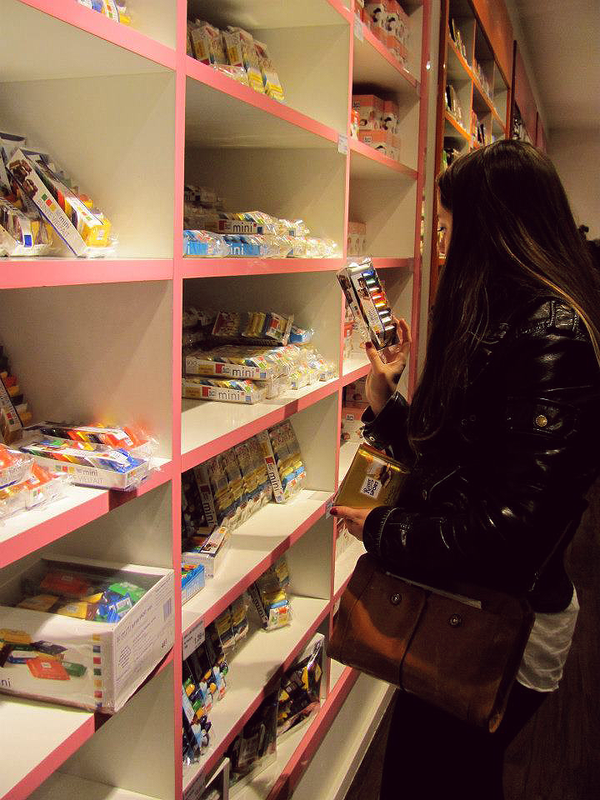 This is me eyeing the variety pack of mini bars (which Ella happened to buy). Clearly that wasn’t enough chocolate to satisfy my sweet teeth. But LOOK at all of those shelves of chocolate!!! There was a “make your own chocolate bar” station where you could melt down Ritter Sport chocolate, add different ingredients (like corn flakes, dried strawberry, nuts, etc. ), and re-form your very own candy creation. 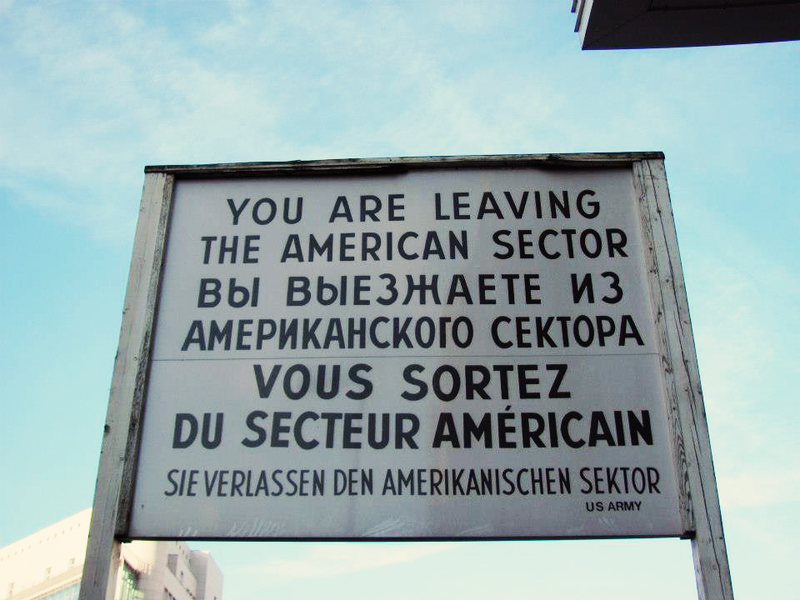 Which was really cool, except for the fact that everyone in the German-speaking world seemed to be in line. So Ella and I were perfectly content to bypass the mayhem and get right down to eating our chocolate. Simply put, I am never overlooking Ritter Sport chocolate in the candy aisle of CVS ever, ever again. Ella and I finished off our busy day of walking and seeing and eating with … well … more eating. We stopped at an “authentic” German restaurant for dinner, where I ate meatballs and mashed potatoes. 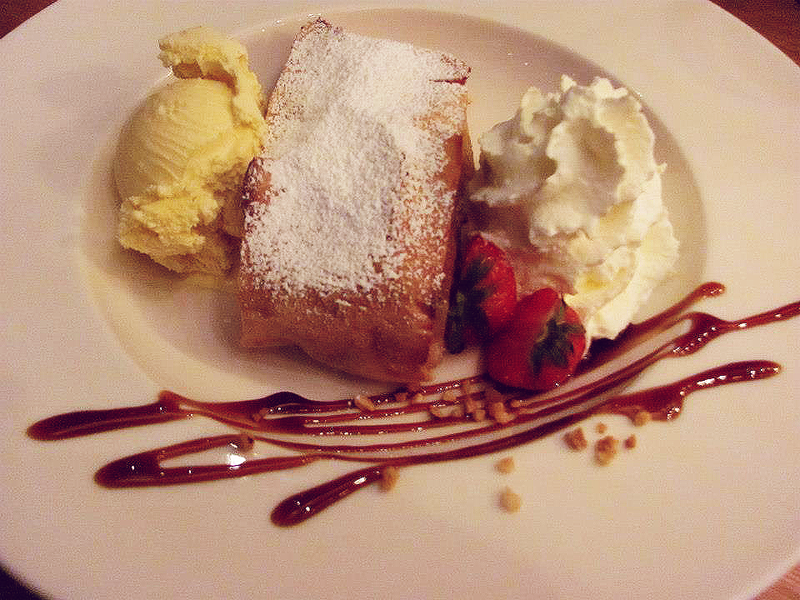 Yeah, that’s apple strudel. Excuse me while I conjure up the delicious memories and begin to salivate over my keyboard. By the end of the night, we were exhausted, stuffed, and high on sugar and happiness. That night, we finished off a drink in our hostel’s bar and called it a night. German beer, German strudel, and German chocolate. 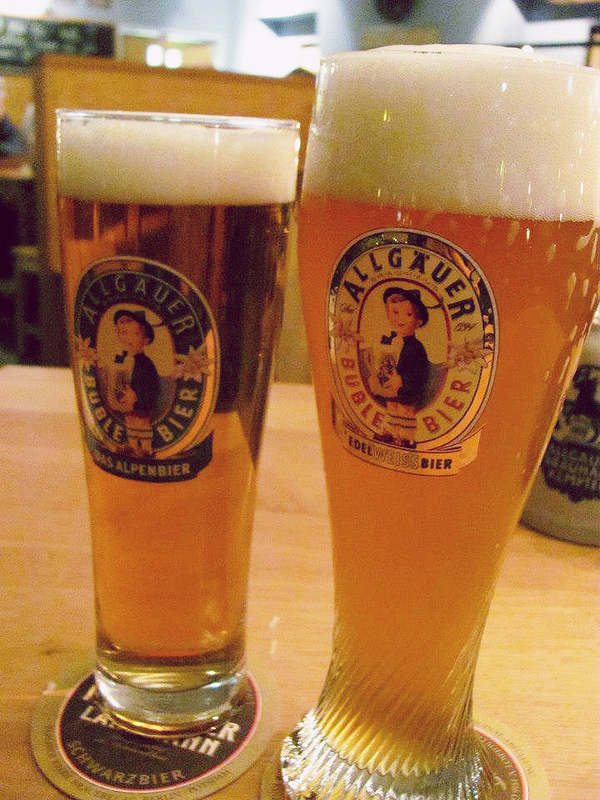 That, my friends, is how two American girls do Berlin … and do Berlin well. Tags: apple strudel, beer, berlin, biscuit, caramel, chocolate, germany, nuts, ritter sport, wafer. Bookmark the permalink.